he Gannon University women’s swim team concluded its 2017-18 season by finishing sixth among 12 teams at the Pennsylvania State Athletic Conference Championships, held Feb 21-24 at the Graham Aquatic Center in York, Pa. The Knight women compiled 537 points in the four-day event, which was won by West Chester, which finished with 1,884 points. It was West Chester’s 12th straight PSAC championship. The opening day of competition was highlighted by a pair of eighth-place finishes for Gannon. 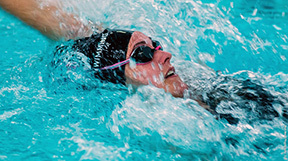 Brynn Driscoll wound up eighth in the 200-yard individual medley with a time of 2 minutes, 12.49 seconds. Driscoll also took part in the 200 medley relay for Gannon, which came in eighth with a time of 1:48.08. Joining Driscoll on that relay effort were Samantha Favret, Meghan Terwilliger and Silvija Taraska. Gannon’s 200 freestyle relay team of Favret, Taraska, Courteney Hubert and Celia Kottakis posted one of the standout performances of the second day of the meet, as the quartet finished fourth by posting a time of 1:37.05. Gannon’s 400 medley relay team of Favret, Driscoll, Terwilliger and Kottakis came in sixth after clocking a time of 3:54.65. Taraska, meanwhile, finished eighth in the 200 freestyle with a time of 1:57.02. On the third day of competition, Gannon wound up with a pair of fourth-place finishers. Terwilliger sped to a fourth-place finish in the 200 butterfly with a time of 2:07.91. The Knights’ 800 freestyle relay team of Taraska, Jillian Pritchard, Hubert and Kottakis also finished fourth, with a time of 7:46.17. Favret, competing in the 100 backstroke, finished seventh with a time of 57.87. On the final day of the meet, Favret finished eighth in the 200 backstroke with a time of 2:07.38. Gannon’s 400 freestyle relay team of Taraska, Pritchard, Kottakis and Hubert wound up sixth with a time of 3:33.74. No member of the Knights’ women’s team advanced to the NCAA Division II National Championships, slated for March 14-17 in Greensboro, N.C.